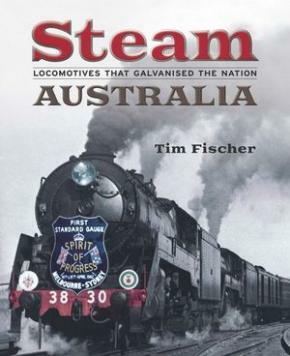 Tim Fischer takes readers into the fascinating and grand story of steam transportation over ten vital decades of transformation in Australia's history. This book is so much more than a history or a set of lists, it is about the great tapestry of transport weaved by the steam locomotive, and Tim details how the nation was galvanised with economic growth delivered by steam. Fischer tracks key steam locomotives that traversed Australia during critical stages of our nation's development and transported soldiers to fields of conflict as we fought in two world wars. For a century, from 1850 to 1950, steam locomotive haulage dominated Australia's various rail systems and, during that period, rail networks expanded from a few short routes in the big capital cities to huge networks reaching every corner of each state. The book also covers the great named express trains hauled by steam locomotives over the decades: Puffing Billy, Robert Gordon Menzies, The Ghan. Special features include information on Albury's 'break of gauge' platform (where two state track systems met), the Amiens branch line (running through Pozieres and Passchendaele stations in Queensland), the 'garnishee' order against the Spirit of Progress, some important characters such as C.Y. O'Connor and many, many more fascinating topics.